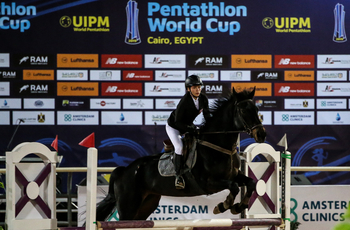 Another golden moment for Egypt ended a memorable fortnight of success for the host nation of UIPM 2019 Pentathlon World Cup Cairo. 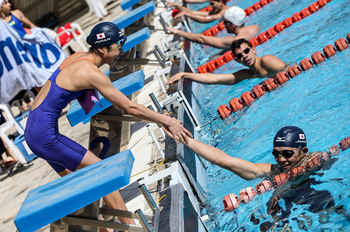 A gold medal in the Mixed Relay achieved in style by Haydy Morsy and Ahmed Elgendy came on the back of an exceptional victory for Elgendy (EGY) in the Men’s Individual Final and a double individual success at the African Championships that made Morsy (EGY) and Sherif Nazeir (EGY) the first qualifiers for the Tokyo 2020 Olympic Games. Egypt (Morsy/Elgendy) were impossible to catch in the Mixed Relay, winning by 36sec from silver medallists Czech Republic (Eliska Pribylova & Ondrej Polivka). Elgendy (EGY) said: “I am very proud of these two gold medals and very happy, and it’s been the best birthday celebration ever. Morsy (EGY) added: “It’s my first World Cup gold medal and I’m so happy I achieved it with Elgendy. We competed together in 2017 and won a bronze medal, and I’m so happy we achieved gold here in Egypt in front of everyone. Pribylova (CZE) said: “We started really well in the Fencing and then the Riding was so-so, but our shooting in the Laser Run was quite good. The Hungarian girl was catching me but fortunately Ondrej’s second shoot was really good. It was a second silver in two days for Czech Republic after Jan Kuf’s heroics in the Men’s Individual Final. France set the standard in the pool thanks to a time of 1min 57.24 by Marie Oteiza and Valentin Prades, Mixed Relay gold medallists at the 2018 European Championships and individual medallists at the UIPM 2018 Pentathlon World Championships. United States (Avery Niemann & Alexander Guzman) were next quickest (2:00.14) while Italy (Alessandra Frezza & Matteo Cicinelli) timed 2:00.57. As France (Oteiza/Prades) lost ground with a modest score of 21V/23D, Egypt (Morsy/Elgendy) completely dominated on the piste with 32V/12D and two extra points in the Bonus Round. No other nation came close to matching that level of scoring, although Czech Republic (Pribylova/Polivka) and Hungary (Reti/Szabo) signalled their intent with 26V/18D apiece. The stars of the Bonus Round were Ukraine, as Valeriya Permykina and Pavlo Tymoshchenko added six additional points to put themselves into medal contention. As if they needed confirmation that it was going to be their weekend, Egypt (Morsy/Elgendy) received it in the Riding arena as a series of potential rivals failed to make any inroads into their lead. France (Oteiza/Prades), Italy (Frezza/Cicinelli) and Japan (Shino Yamanaka & Hikaru Shimano) were all eliminated, while Czech Republic (Pribylova/Polivka) dropped 28 penalty points and Hungary (Reti/Szabo) 38. Even Ukraine (Permykina/Tymoshchenko) failed to put pressure on the leaders with a score of 276. Egypt (Morsy/Elgendy) took full advantage with the best score of the round, conceding just 14 penalty points. With a huge cushion of 47sec, Egypt (Morsy/Elgendy) knew that all they had to was avoid a major malfunction on the shooting range to secure gold. And with two athletes in such confident form, that was never likely to happen. As home spectators revelled in their team’s success, the real area of interest for other supporters was the battle for silver and bronze, where Hungary (Reti/Szabo) kept pressure on Czech Republic (Pribylova/Polivka) throughout. In fact, Reti (HUN) made up so much ground on Pribylova (CZE) that their two male partners spent the first half of their relay leg almost side by side. In the end, the greater experience of Polivka (CZE) won the day as an exceptional final shoot allowed him to leave Szabo (HUN) in his wake. 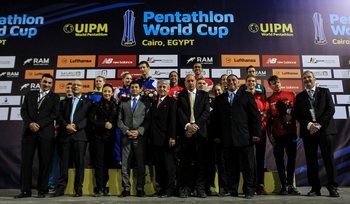 UIPM President Dr Klaus Schormann said: “For the competition organisers and the Egyptian Modern Pentathlon Federation, to have this victory by their athletes in front of the Minister for Youth and Sports, I think it was a glory day for Egypt. “This Mixed Relay was an exciting team event, which we are promoting for the future programme of the Olympic Games, hopefully in Paris 2024. To have Czech Republic and Hungary on the podium underlines the motivation of countries which are also organising competitions in this World Cup season, and with Ukraine in 4th place it shows that the top nations are competing in the Mixed Relay. 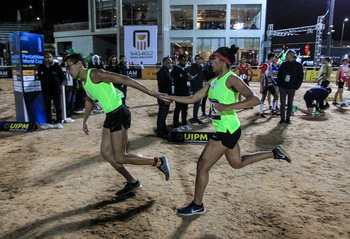 Catch up on highlights of UIPM Pentathlon World Cup Cairo at UIPM TV and review the results and reports at the UIPM website. The next competition on the UIPM calendar is UIPM Pentathlon World Cup Sofia from April 10-14.